Last Wednesday, the Office of Student Involvement and Student Senate hosted the fifth annual Leadership Awards Ceremony in the Central Dining Room of the Benham-Pence Student Center. The evening began with an introduction by Elizabeth Ames, director of Student Activities. Ames applauded Wittenberg for its 100 organizations on campus, 24 sports teams and 46 percent involvement in Greek life this year alone, making Wittenberg “an amazing place to live, work and call home,” she said. 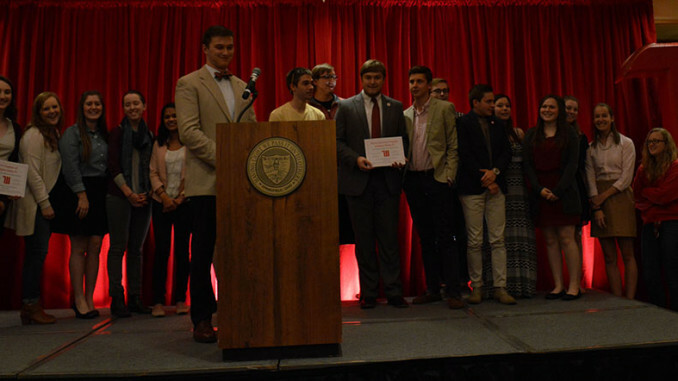 The evening was hosted by various members of Student Senate and the campus community, who read descriptions of each award along with special words written by the nominators. Award highlights include: Jamison Shriver, ’16, of Delta Sigma Phi and Haley Mucha, ’16, of Gamma Phi Beta as Greek Man and Woman of the Year; Professor Wendy Gradwohl, Dawn Kolb, Laura Siemon, Kelly Mahlum and Jeanne Riedel as recipients of the Unsung Hero Award; and Annie Carroll, ’19, Emerging Leader of the Year. Waverly Hebert, ’16, was recognized as the Student Woman of the Year, an honor designed to recognize women who display confidence, pride and strength, helping other women to do so through leadership and example. The award’s nominator wrote that Hebert is “a champion for women, though I doubt she would ever describe herself that way . . . I believe she will continue to have a positive impact on other women in the future.” On campus, Hebert serves as the outgoing co-president of No Woman Left Behind, and was formerly a Lead OA and peer mentor. The Chapter of Excellence award was given to Delta Gamma, a sorority whose “overall excellence in chapter operations . . . set the standard for fraternity and sorority life on Wittenberg’s campus,” the award description read. Current president of Delta Gamma Pearl Ernat, ‘17, was honored to receive the award, speaking on behalf of her chapter that they “have been consistent and dedicated in our efforts to improve all aspects of our chapter. It is rewarding to be recognized for our efforts within Wittenberg’s community,” Ernat said. Ames was certainly hoping for the audience to walk away with a sense of honor for every award. “We are so busy all the time that we don’t always take the time to recognize individuals for their efforts,” Ames said, reflecting on the evening. The event drew large crowds from various portions of campus, including staff, faculty, students and families. “This year, I was really excited about the increase in the number of nominations this year; we went from 76 to 109. I hope people continue to value the importance of co-curricular leadership on this campus,” Ames said.